Located in North Venice, Toscana Isles offers single family homes that are elegantly and spaciously designed with many designer features included. Two spectacular lakes (one 55 acres, one 94 acres) that are connected, offer residents the opportunity to canoe & kayak. Homes located on the lake can launch right from their backyard dock or use the clubhouse dock. A “Must See” to appreciate the stunning views of a 55 acre lake from your lanai. Just one mile east of the I-75 Laurel Road exit to Knights Trail Rd. An ideal location for commuters, yet still only minutes away from white sandy beaches. Easy access to I-75. 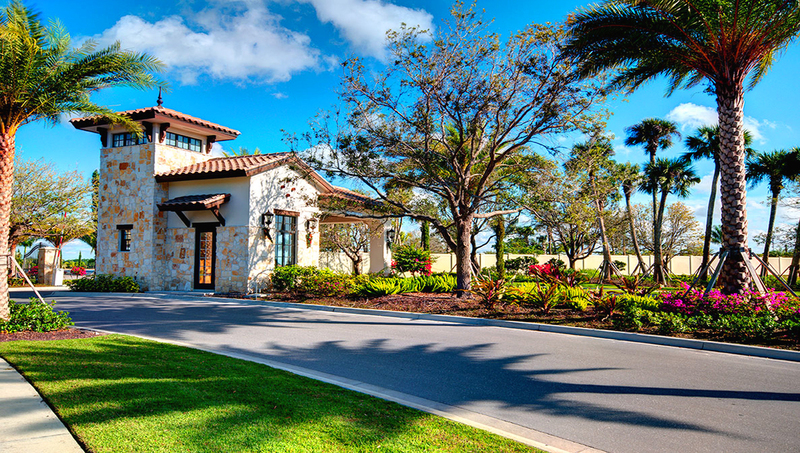 Only a 20 minute drive to Sarasota for fine dining, world class shopping and cultural events. 10 minute drive to downtown Venice. 15 short minutes to beautiful pristine beaches. All homes have hurricane protection and a bunch of low energy features. 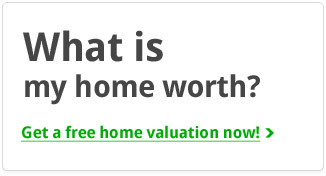 For a peace of mind all homes are also offered with a ten year limited warranty program. A gate for privacy, a tot lot playground, tennis and Bocce Courts, a boat launching deck and a dog park are part of the general features. The community center, which is still under construction, will offer other amenities in addition: a resort style infinity edge pool, poolside cabanas, a fire pit, a state of the art fitness center, lake front activities rooms, gathering rooms and a catering kitchen. An activities director will come on board within the near future. Under construction. This is new floor plan now being offered with 1641 sq.ft. and with a large covered screened paver lanai it’s a perfect winter getaway. The home has high ceilings and eight foot doors with crown molding throughout the main living area and a beautifully appointed kitchen that has 42″ cabinetry, granite counters and stainless appliances. Bedroom 2 is very spacious and has its own walk in closet and a study with a closet gives this floor plan an abundance of storage. The home has ceramic tile through the main living areas and kitchen and baths. The Clubhouse is now open and features an infinity pool, fitness, billiards, tennis, bocce, dog park and tot lot and several gathering rooms and a catering kitchen. Turn into Toscana Isles and then right on Maraviya and right on Ventosa and this is on your left. Under construction. This is a new floor plan now being offered with 1816 sq.ft. and with a large covered screened paver lanai and private yard. The home has high ceilings and eight foot doors with crown molding throughout the main living area and a beautifully appointed kitchen that has 42″ cabinetry, granite counters and stainless appliances. The large enclosed Flex space is ideal for a home office/den and perfect when extra guests come to stay the night. The great room and dining are combined and give it a very large and open feel. The master suite has two large walk in closets and a large vanity area in the bath. The home has ceramic tile through the main living areas and kitchen and baths. The Clubhouse is now open and features an infinity pool, fitness, billiards, tennis, bocce, dog park and tot lot and several gathering rooms and a catering kitchen. Turn into Toscana Isles and then right on Maraviya and right on Ventosa. Under Construction. 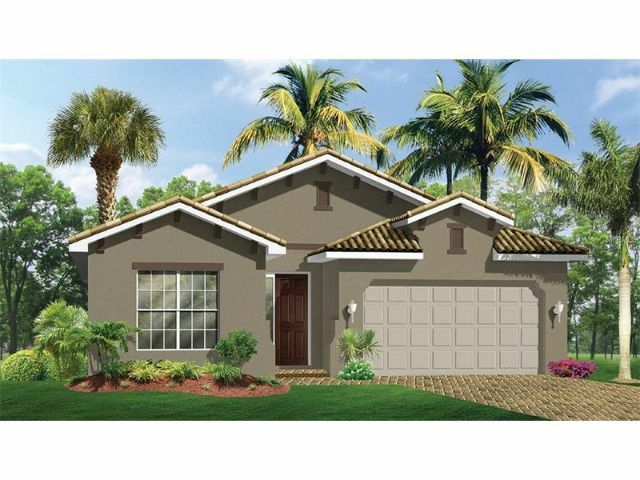 Beautiful, brand new, 2 Bedroom 2 Bath, 2 car garage. The ‘Clifton’ ?at 1816 sq ft- features a great room and a den. Home is built with a tile roof, and features brick paver driveway and covered, screened lanai. Crown molding, tile and carpet throughout, stainless appliances, and granite kitchen countertops are just some of the many features in this home. The master features two large walk-in closets. 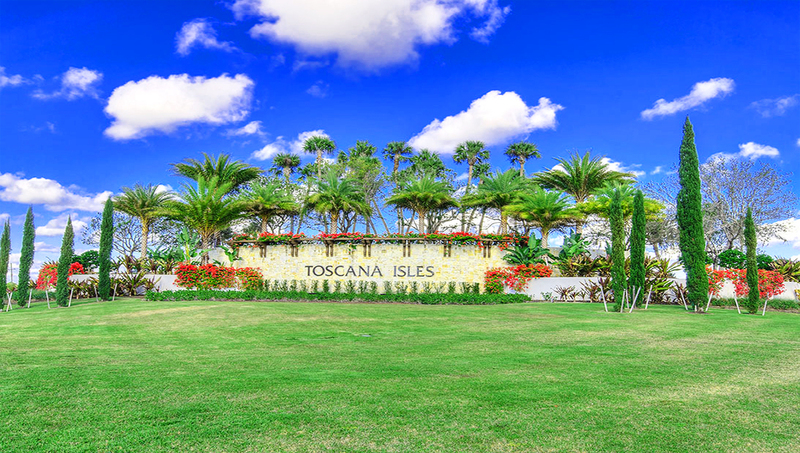 Toscana is a lawn maintenance included, gated community. Amenities include a community heated community pool, club room, and fitness center, all in an 8,000 sq ft Clubhouse. A community designed for active lifestyle, including fishing, kayaking, and canoes on a 60 acre lake. All centrally located, close to Venice Island and it’s fabulous beaches, restaurants, and shopping. Under Construction. 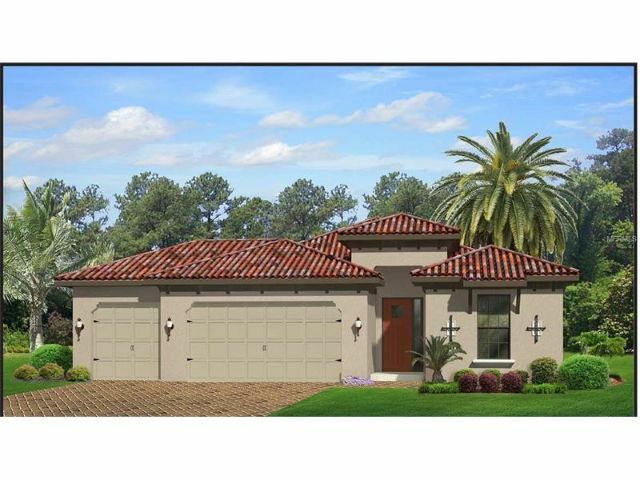 Toscana Isles New Construction ‘The Pembroke’ is a single story, 3 bedroom, 2 bath, 2 car garage single family home in the master planned Toscana Isles. It features a first floor Master suite, with dual sinks and garden tub, walk ?in closet. The great room has a spacious kitchen with granite countertops and, a generous eat-in kitchen. The home has ceramic tile in the Great Room and carpeted bedrooms. 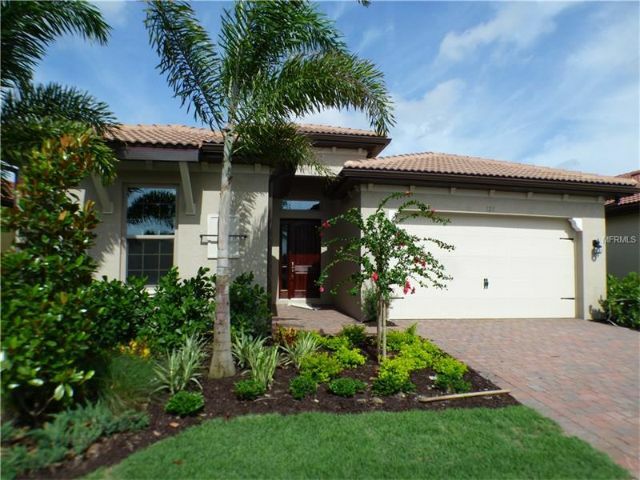 Toscana is a lawn maintenance included, gated community. Amenities include a community heated community pool, club room, and fitness center, all in an 8,000 sq ft Clubhouse. A community designed for active lifestyle, including fishing, kayaking, and canoes on a 60 acre lake. All centrally located, close to Venice Island and its fabulous beaches, restaurants, and shopping. 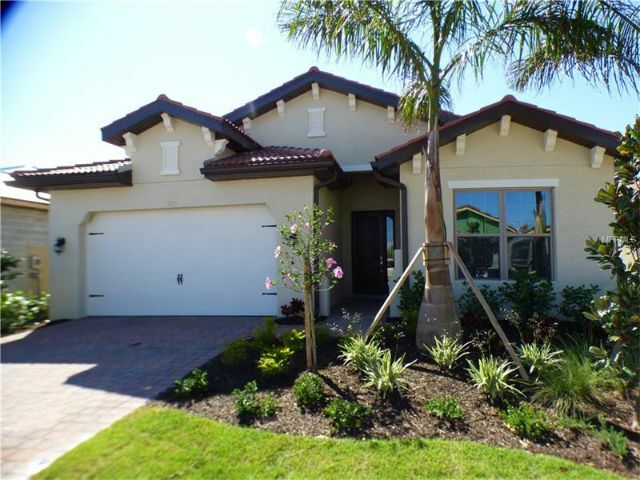 The Edison floor plan is one of our most popular homes located inside the gated entry of Toscana Isles. 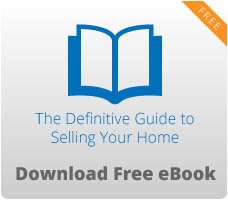 A furnished model is available to see at the sales center. This home is an exceptional value with 10 foot ceilings, accentuated with two tray ceilings in the foyer, tray ceiling in the great room and master bedroom and crown molding inside each tray and throughout the main living areas as well as the master and the very private den. The eight foot doors throughout make it appear vary spacious. The home will have 42″ whiite kitchen cabinetry and the island and counters in the kitchen have beautiful Grey Expo Silestone. Ceramic 20″ x 20″ 24 tile throughout main living areas and the den. All in the most sought after Grey motif. Wait until you see the master bath! Upgraded Stainless appliances and includes a refrigerator. The Clubhouse has a resort pool, fitness, tennis, bocce ball, dog park, catering kitchen and tot lot. This home is located on Ventosa Place, turn right when you enter the community and turn right on Ventosa. We suggest you visit the model center first and we will take you to the home. Under Construction. ‘The Pembroke’ is a single story, 3 bedroom, 2 bath, 2 car garage single family home in the master planned Toscana Isles. It features a first floor Master suite, with dual sinks and garden tub, walk ?in closet. The great room has a spacious kitchen with granite countertops and, a generous eat-in kitchen. The home has ceramic tile in the Great Room and carpeted bedrooms. 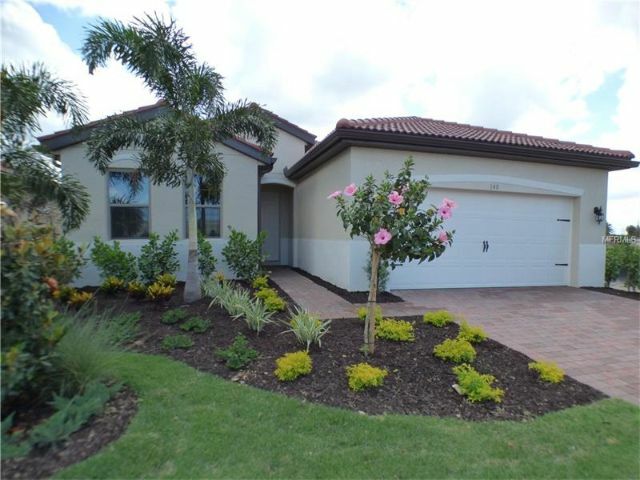 Toscana is a lawn maintenance included, gated community. Amenities include a community heated community pool, club room, and fitness center, all in an 8,000 sq ft Clubhouse. A community designed for active lifestyle, including fishing, kayaking, and canoes on a 60 acre lake. All centrally located, close to Venice Island and its fabulous beaches, restaurants, and shopping. Under Construction. 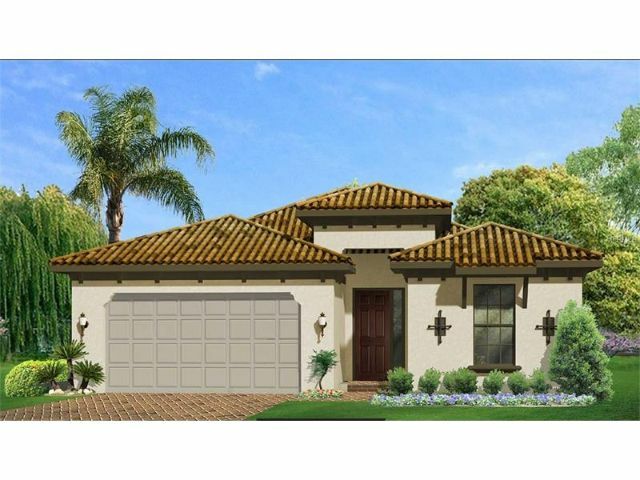 Toscana Isles- New Construction ‘The Pembroke’ is a single story, 2 bedroom, 2 bath, 2 car garage with den, single family home in the master planned Toscana Isles. It features a first floor Master suite, with dual sinks and garden tub, walk ?in closet. The great room has a spacious kitchen with granite countertops and, a generous eat-in kitchen. The home has ceramic tile in the Great Room and carpeted bedrooms. 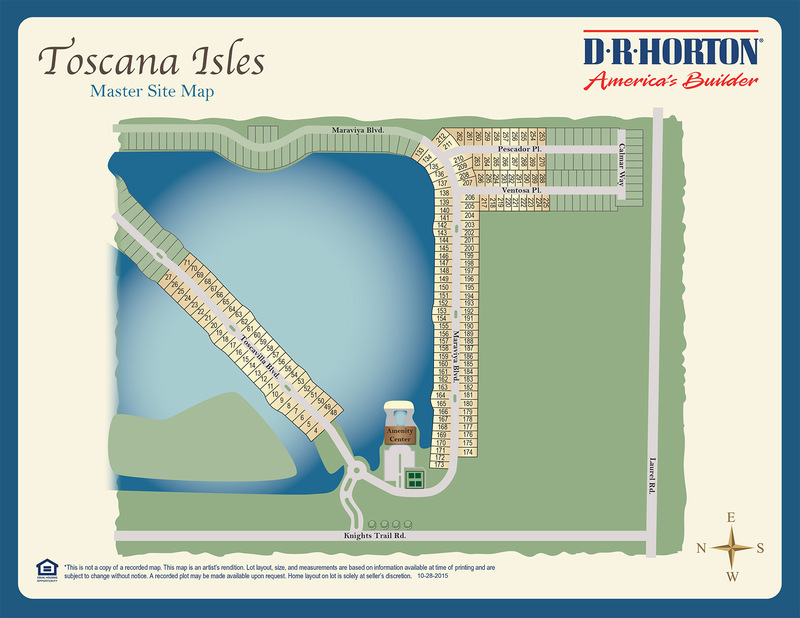 Toscana is a lawn maintenance included, gated community. Amenities include a community heated community pool, club room, and fitness center, all in an 8,000 sq ft Clubhouse. A community designed for active lifestyles, including fishing, kayaking, and canoes on a 60 acre lake. All centrally located, close to Venice Island and its fabulous beaches, restaurants, and shopping. Under Construction. Beautiful, brand new. 3 Bedroom 2 Bath, 2 car garage. The Edison is our most popular floor plan, with 1983 sq ft, featuring a great room and a den. Home is built with a tile roof, and features a brick paver driveway, and covered, screened lanai. 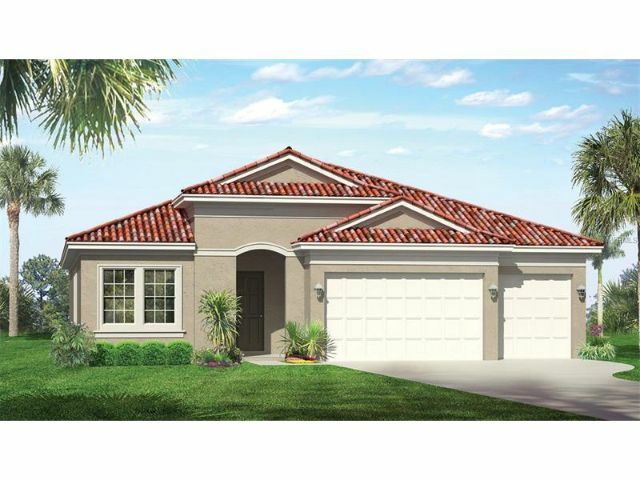 Coffered ceilings, crown molding, tile and carpet throughout, stainless appliances and granite kitchen countertops are just some of the many features in this home. . Toscana is a lawn maintenance included, gated community. Amenities include a community heated community pool, club room, and fitness center, all in an 8,000 sq ft Clubhouse. A community designed for active lifestyle, including fishing, kayaking, and canoes on a 60 acre lake. All centrally located, close to Venice Island and it’s fabulous beaches, restaurants, and shopping. Inside the gates of Toscana Isles this Bedford floor plan is our favorite two story home with large bedrooms and an upstairs loft with oversized garage and master on the first floor. The home will have whiite 42″ kitchen cabinetry with beautiful granite counters. 18 x 18 Ceramic tiles throughout main living areas. Stainless appliances, tray ceilings and designer baths. The Clubhouse has a resort pool, fitness, tennis, bocce ball, dog park, catering kitchen and tot lot. This home is located on Ventosa Place, turn right when you enter the community and turn right on Ventosa. We suggest you visit the model center first and we will take you to the home. Under Construction. 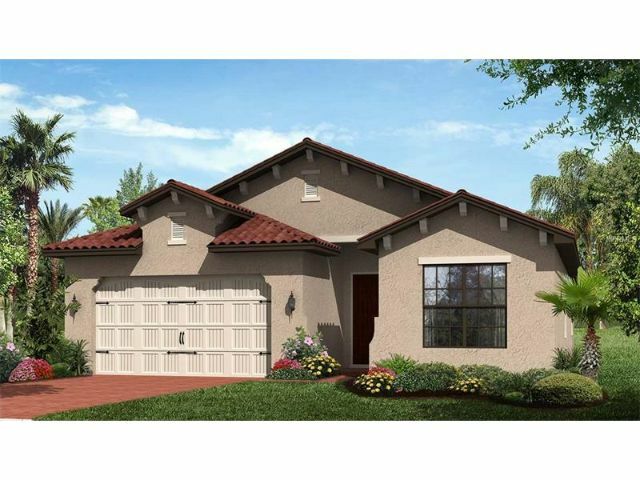 Beautiful, brand new, 3 Bedroom 3.5 Bath, 2 car garage. The bright and airy Ashbury floor plan, with 2431 sq. ft., is an open great room plan, with a formal dining room and a den. Home is built with a tile roof, and features brick paver driveway, screened, covered lanai, and a spacious utility room. 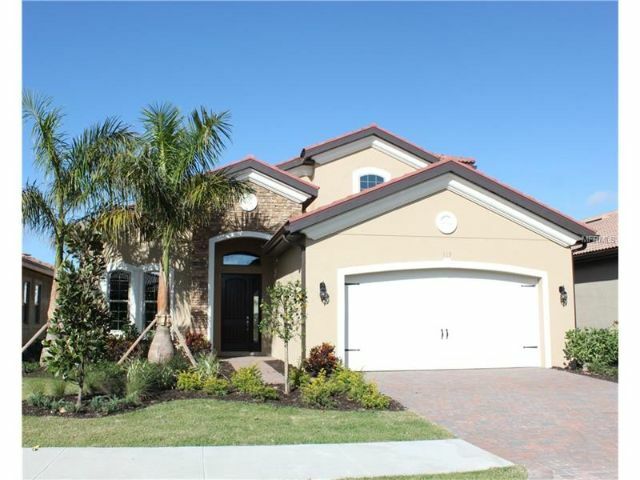 Coffered ceilings, crown molding,tile throughout the main living area, stainless appliances, and granite kitchen countertops are just some of the many features in this home. . Toscana is a lawn maintenance included, gated community. Amenities include a community heated community pool, club room, and fitness center, all in an 8,000 sq ft Clubhouse. A community designed for active lifestyle, including fishing, kayaking, and canoes on a 60 acre lake. All centrally located, close to Venice Island and it’s fabulous beaches, restaurants, and shopping. This is the Destin with 2368 sq.ft and 4 bedrooms with 3 baths and very open with separate Dining and a Café. This is on the 90 acre lake with an amazing view located inside the gated entry of Toscana Isles with an abundance of additional designer features. The home will have 42″ Glazed off whiite kitchen cabinetry, Ceramic tiles throughout main living. 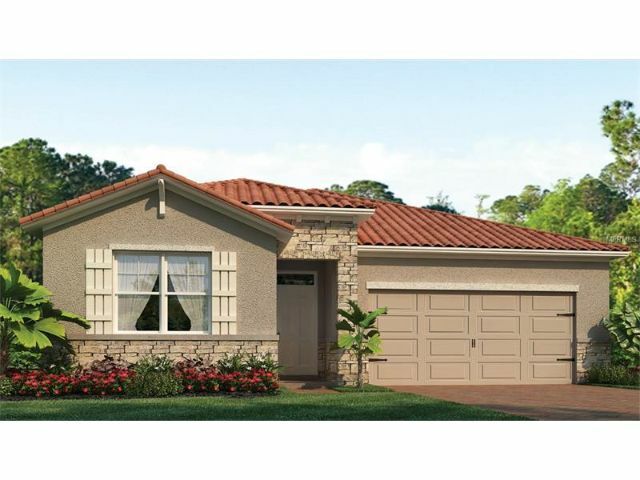 Granite counters, stainless appliances, tray ceilings and designer tiled baths. Plenty of crown moldings to set off the ceilings and a screened lanai. The Clubhouse will boast a resort pool, fitness, tennis, bocce ball, dog park, catering kitchen and tot lot. Under Construction – Ashbury 2431 sq.ft. 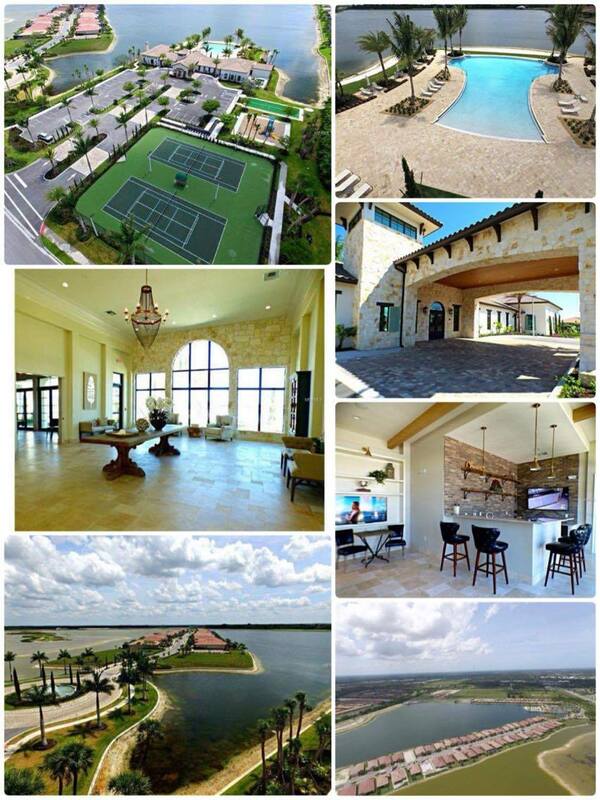 with 3 car garage located on the Huge 90 acre lake inside the gates of Toscana Isles. Wait until you see the view! This home has Tray Ceilings in the entryway, Great Room and Master Suite accented with crown moldings, 42″ Kitchen cabinets in Expresso with Whiite Ice Granite counters, stainless appliance package to include refrigerator and 24 x 12 Gray designer tile throughout main living areas. Mosaic glass backsplash in kitchen. Crown molding, upgraded baseboards and casings. 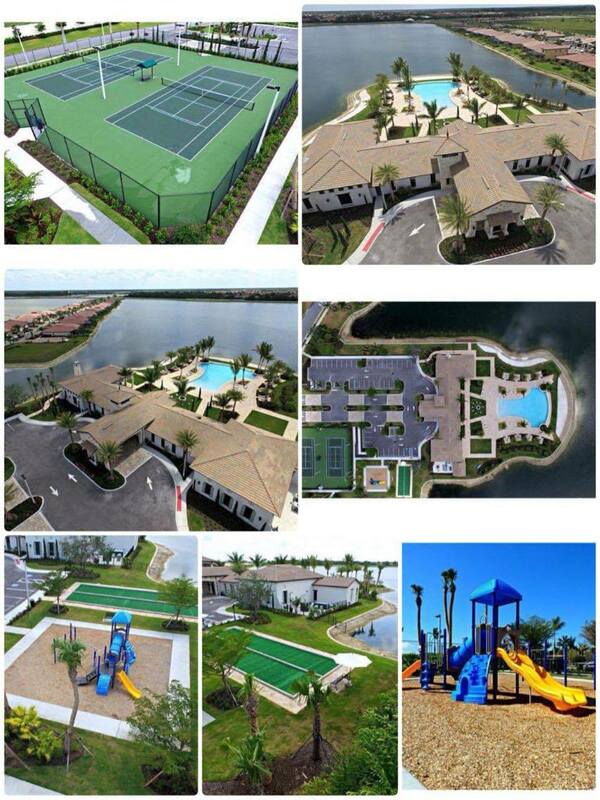 Clubhouse has zero entry resort pool, tennis, fitness, bocce ball, billiards, catering kitchen, dog park and tot lot. Under Construction. Award winning Wheaton plan ? features 3 bedrooms, 3 and a half baths, a den and terrific kitchen with an enormous walk in pantry. The home a great room layout, with designer finishes, and includes an eat-in kitchen with large center island, granite countertops and stainless appliances. The spacious master suite features a large walk-in shower, dual vanities, and twin walk-in closets. 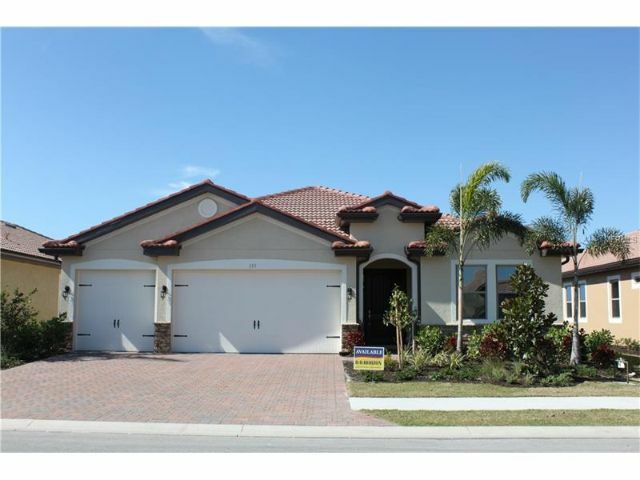 All this in a total of 2540 sq ft, with a three car garage, situated on a lake view lot in Toscana Isles. 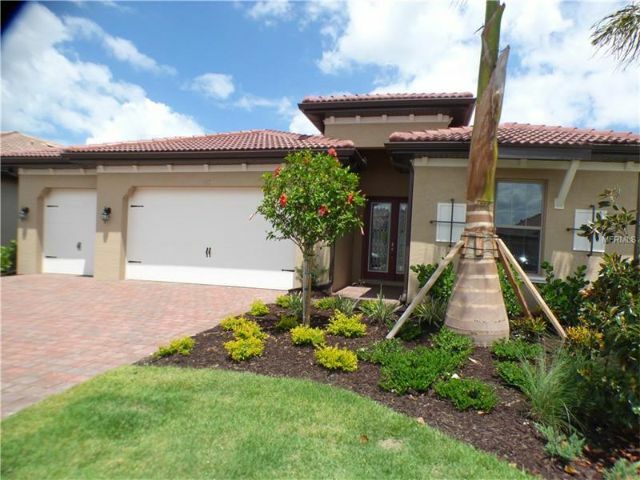 Toscana is a lawn maintenance included, gated community. 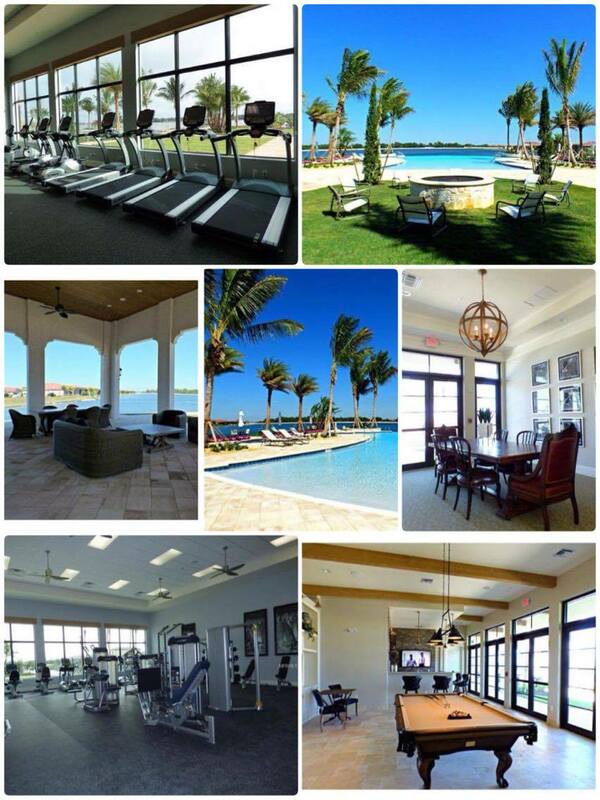 Amenities include a community heated community pool, club room, and fitness center, all in an 8,000 sq ft Clubhouse. A community designed for active lifestyle, including fishing, kayaking, and canoes on a 60 acre lake. All centrally located, close to Venice Island and its fabulous beaches, restaurants, and shopping.